Welcome to the Voiceover Guide! Hello – and welcome to The Voiceover Guide! We take voiceovers seriously, and if you’re reading this, so do you—which means we’re off to a great start together. Our goal is to make voiceover work profitable—and fun—for everyone involved, no matter where in the world you are. That’s an important distinction: we’ve written this guide to focus specifically on the online voiceover environment because it’s expanding so rapidly. We also firmly believe that it’s where the future of the industry lies. If you’re a newbie, this guide will tell you everything you need to know about voiceovers and voice-acting so you can get yourself going. If you’re a seasoned pro, maybe it’ll remind you of a few things you might have forgotten. It also contains a lot of information and links that should prove useful—whatever your level of expertise. I just wanted to take some time to say thank you very much for this guide. From your description of the birth of this guide I can appreciate your idea recording methods and I share the same habits in my current transition from working a non-creative, “okay” day job to my goal of becoming a full time voice talent. I have kept a small notebook filled with random thoughts,ideas and note of how to achieve my dream for longer than I can recall. I hope to make the complete switch in about 2-3 years and I’m sure this guide will prove very useful so once again, thank you and please keep it up. You are helping people. This is most welcome, Steven! This definitely is not a field for beginners. I thought that because I have considerable experience and even exposure as an independent radio producer, that it would be easy to get voice over work. But that has been far from the case. There is much more than meets the ear in this business, and I’m looking forward to learning the ropes from a pro. If you really need any other info about the voice over field please contact me. I’m a working professional with the credentials to prove it. No the voice over field is not easy. But it can be done. It’s not a hobby. Hello… I’m very Interested in getting in the voiceover Industry. Can you give me any tips or advice on how to get started??? My day job as a Flight attendant for “American Airlines”…has been very challenging …”Inclueding chapter 11 fileling of the Airline”. I have been with Voice 123 for a few years and have booked many gigs through them that have been lasting gigs…however…is is now time to kick it up a notch. The information you are giving is priceless. Thank you …I will be reading and leaving my thoughts. Hello there Steven, My name is Randy. Im 48 years of age, and am self employed in the retail industry for the last 33yrs. Over the last 4 years I have people always approaching me or asking me if I have ever done any radio, TV, or voice work and when I reply no, and ask why! they always say I have a voice that is unquie because it is clear but very believable and a voice that makes them pay attention. Well I have finally decided that at 48 yrs of age, that I would really like to give it a shot, whats the worst that could happen I actually get work and the worst I get nothing, but at least I tried, either way Im a winner. Now the problem, I really have no idea of how or where to start, I am old school when it comes to speaking to others, meaning I am a social butterfly, and am much better talking face to face with people rather then trying to have them get a feel for me thru email or text. So if you were in my shoes what would you suggest. Although I’ve worked as an on air broadcasting for a number of years, translating to online voice work is obviously very very different. Thank you for this guide. Some of it is very much what I expected to read (setting up a sound booth, how to deal with clients, being professional) but much of it is not. And it will certainly help smoothing what is clearly going to be a steep learning curve. Thank you – a very clear and comprehensive guide. This is so flipping cool, Steven! A big thanks for taking the time and energy to assemble this beautiful presentation. You’ve been such a wonderful resource to the voiceover community and I appreciate your efforts! Thank you for this amazing guide! I’ve learned a lot from it. Thanks for your advices and for the opportunity to expand my field to new horizons. Greetings from Mexico City. Accurate, complete, insightful. The detail and tone of your writing is always impressive. Hi Steven…when I discovered your guide I thought I had died and gone to heaven. I won’t tell my age, but I’ve been around a while. I’ve studied VO,for several years but what I’ve learned from your guide will take me to another level to operate my VO business with confidence. Thank you for sharing. There’s so much really useful information here! The links to other sites are particularly helpful for that extra level of detail. You’ve doubled my bookmarks list! Thanks so much for this! What a great read. I found it not only useful but inspiring. Congrats on your hard work! 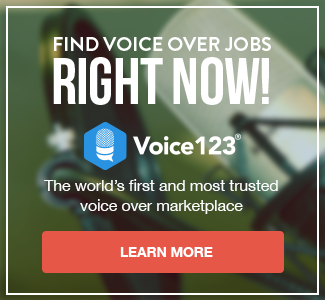 This is a great guide to everything you need to know about getting in to voice overs from voice skills to studio equipment required and from demo reels and demo creation to helpful resource list for voice actors. I wish I had had this type of information when I started out as a voice over artist. Great read and great work. Thank you for taking the initiative on this!! Great stuff. Thank you for taking the initiative on this Stephen. Great stuff! I’m newto this and all the infor. Was great. Thanks Steven. I’m extreme-glad that you put together this article! Thanks man! I particularly noticed a line in this introductory article that I can relate to. You stated that you need to stick to what you know. And then you said you are willing to learn. That is the position I am in. I come in not being an engineer, but only as a voiceover. I didn’t want to false advertise, when I first introduced myself, and, I didn’t know that being an engineer was required. So, when I first came to this site, I only advertised myself as a voiceover. However, now I wish I was an engineer, looking back on it. I would have advertised as an engineer, as well, if I was knowledgeable in that field, but I am willing to try to learn to be an engineer, also. I confess, I never worried about equipment being outdated, because other people, who were engineers, a engineered my projects for me. I have tried to learn engineering in the past, but failed. Some have it, and some don’t. However, I am willing to try again. Thank you for your efforts, through your articles, to help me. The best thing to do is find a voiceover coach, someone who is either working as a v/o actor or is a producer working with talent all the time. You need someone to assess where your voice would fit and what kind of work you’re more likely to get. Targeting sectors of the industry with the right kind of voice demo is crucial to getting a leg up. A good coach will also work with you on scripts and help you refine techniques for the different kinds of voice work out there. I do Skype voice coaching with those who can’t get to work with me in Melbourne. People tell me I sound just like Ray Romano. Everyone tells me I should do voiceovers. How do I begin the process? I m interested in giving voice over..zero exoerience,beginner…dnt know where to strt from… From india ..
Hi Niki! contact us to help@voice123.com. We’ll give you all the information so you can start a Voice Over career! Hi! I want to do voice over work but I’m really young. I don’t have any experience, so I guess that makes me a beginner.. can you help me? I M interested in giving in voice over in Bengali.I am a new comer in this..Can u plz help me abt this? I dnt know where to start from & what shud I do to b an expert in this profession.. The whole tips reveals insightful, vivacious look which is wonderful….i am following these all & looking forward. This is Amee and I have just finished my Radio programming course in which Voice Over training is also included and had joined this course due to VO only and am very passionate about the same. and am From Ahmedabad Gujarat, I don’t know to get in this world of VO specially in Gujarat so kindly let me about all these and how does this work is done and all .. I m from India. i want to give voice over. .but just can not understand from where to start.. It will be great If will have any suggestions or any opportunity for it. Thank you. Several years ago a purchased a new laptop and, quality mic, (MXI V69) new. In case, and a Pro Audio/Vocal interface. My studio is insulated and NO Close neighbors or outside sounds. I retired approx June 2012, took a long time off trying to remodel our home and in 2014 developed prostate cancer. Removed , with a long recovery, 1 year later, they found lung cancer, treatable. So far, I am cancer free. Thank my God. I have not tried to hook up the interface, as I don’t know how to. I have no clue how to begin a voice over career. I have been front man , bass man for many Texas Groups and Ive been told all my adult life, I had a good voice. It’s southern, Texas, mid to low, I definately have a Texas drawl when I want to,, “Well howdy maam, let me get that door for you. The pleasure is all mine little lady, then go into my southern bubby accent. Dumb, funny. I am Irish by blood,born and raised Texan, Working on my Irish vocals as well. Any assistance you can give me would be appreciated. Due to the two illnesses, I can not spent alot of money. I’m a nube looking to get started. I just have no idea where to start. I’ve been told by a lot of people that I have a fun, interesting voice and I should do voiceover work. Does anyone know a good place to start?